Sometime around January, the buzz began. A new restaurant was opening in Jackson; one that sources local ingredients and dishes out new Southern cuisine and it’s going to be………….downtown? Yes, downtown Jackson was going to get a flagship restaurant, along with new construction and a revitalized King Edward, one that could spearhead the revitalization of downtown Jackson. Well, that’s what I gleaned from all the chatter. As is the case with most restaurant openings, what had been a planned summer opening turned into a fall opening, then specifically September. When the month of September had come and gone, the new target date was October. Apparently October was the magic month as Parlor Market opened for dinner early that month, followed by lunch service in November. It was as if the floodgates had opened. Glowing comments on the facebook page, a front page feature in the Jackson Free Press, Eat Jackson rating the PM Burger as one of his five favorites. Everything was coming up roses for Parlor Market. Curious to see if it was all a “new restaurant” buzz or if Parlor was actually worth the fuss, I stayed my first visit until they began serving lunch. Since I was eating with a healthy sized group, I thought it was the perfect opportunity to try a wide variety of dishes. Lunch started with the Spicy Pimento Cheese. 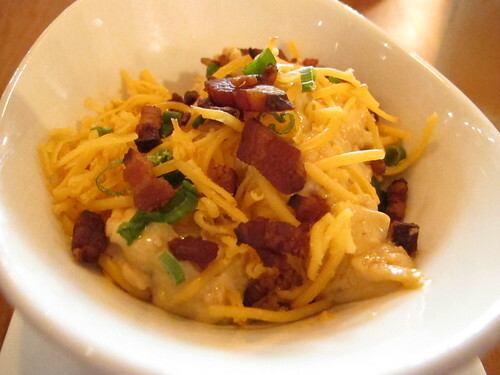 I usually ignore any pimento cheese on the table; I’ve just never been a fan. 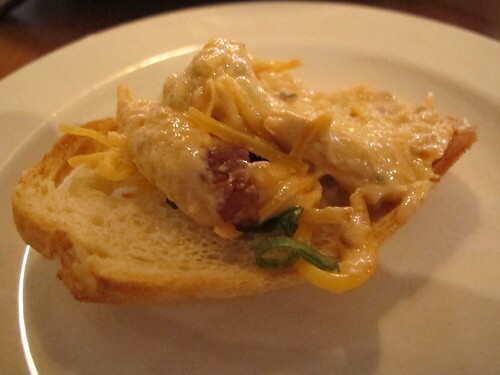 With Parlor’s take on pimento cheese, my opinion has changed. 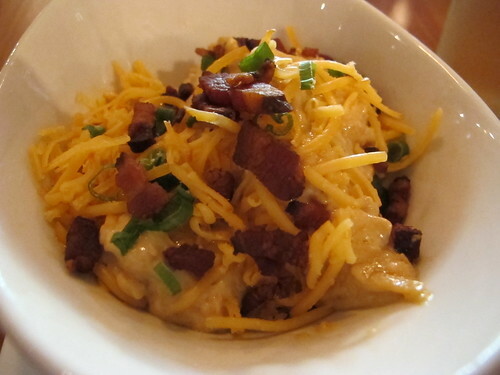 This was deliciously creamy, smoky, and full of bacon pieces. Soon everyone was clamoring to get an extra taste of the pimento cheese which lead to the near constant flaw of dips at a restaurant: we ran out of crostini. 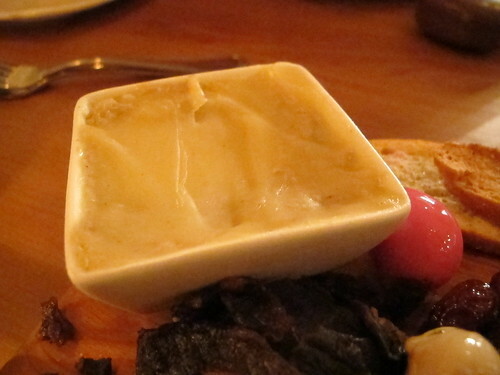 Even with a meager supply of crostini, I was fighting for another knifeful of this smooth, smoke laden dip. With five people at the table, a dozen oysters seemed like an excellent idea. 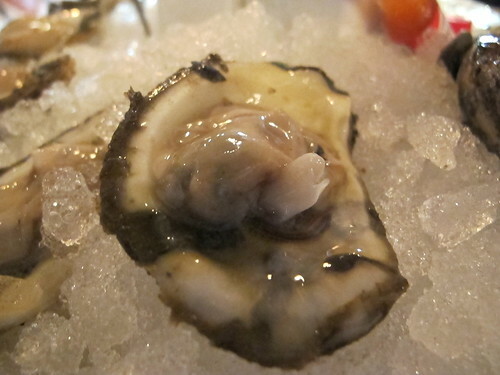 Those fat, gulf oysters certainly looked delicious. 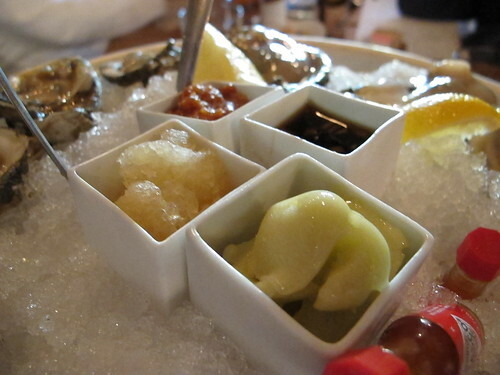 Parlor serves their oysters with a choice of sauces: a bacon mignonette, a lime guajillo granite, a bloody mary cocktail sauce, and a apple celery sorbet. 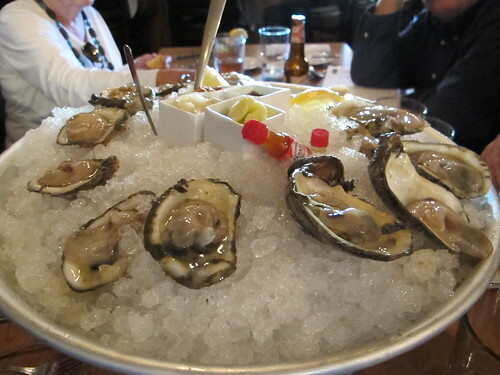 Even though I prefer a smaller, brinier oyster, this was still a nice tray of oysters. 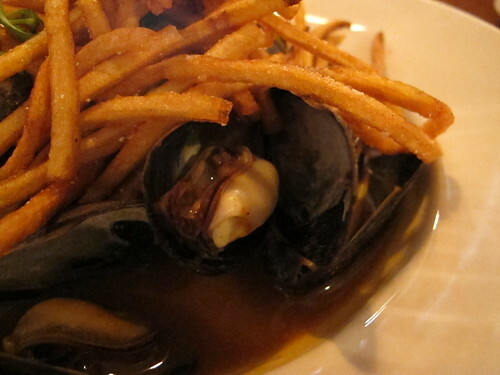 Based on the server’s description, I was expecting a sort of gullah stew with the oysters. This was more of a curry broth with a very pungent cilantro flavor. Regardless of expectations, this was a pleasant dish. 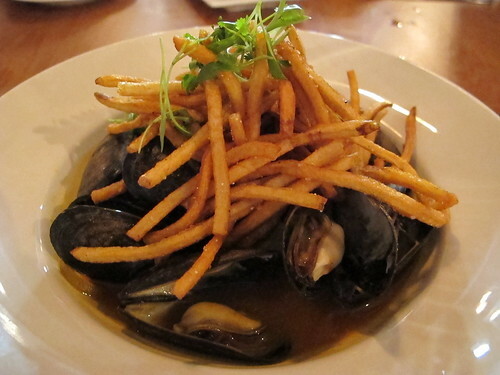 The mussels were nicely briny, but I was disappointed in the lack of crispiness in the matchstick potatoes. On the Parlor Market lunch menu, there’s a nice array of salads, a few tacos, and a half dozen or so choices of sandwiches. 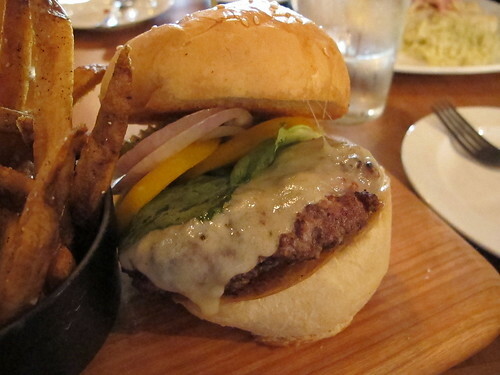 While I was tempted by the idea of a pork belly slider or a Reuben, I just couldn’t turn down the PM Burger. Served with a side of russet potato fries, and topped with butter lettuce, heirloom tomato, and white cheddar, it’s a sight to behold. 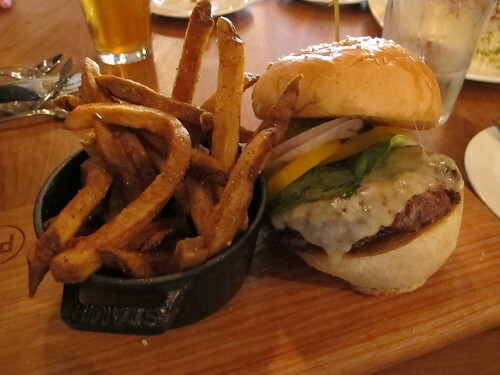 That’s not your average hamburger bun. 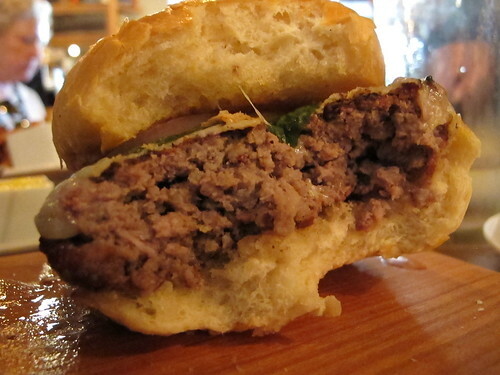 The first bite is a whirlwind of smoky, salty, beefy, all the adjectives you look for in a burger. Actually the burger seems to have a pretty heavily seasoned exterior, something that’s only accentuated by the white cheddar. I was hoping the pickles would play more of a foil to the rich cheese, but they were there more for texture than standout flavor. One real downside was the temperature. I asked for a medium rare burger, and while it was overcooked, it was still quite tasty. Towards the end, I began to suspect the bun was so large for a reason. 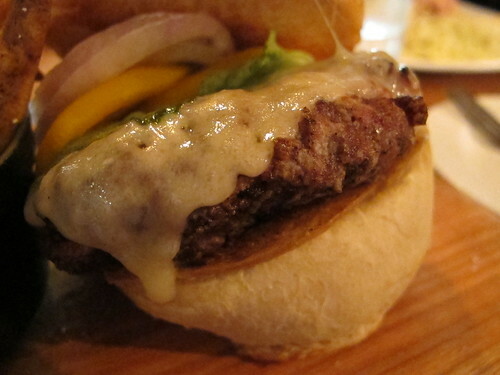 It seems that the bottom bun soaked up all the juiciness of the burger. This made each bite a little soggy but quite tasty. Since I prefer savory to sweet, I tend to avoid the dessert menu at restaurants, but I’d heard such rave reviews about the desserts atParlor Market, that I had to give them a try. Everything on the dessert menu sounds appetizing, but it was the Walk Down Memory Lane that really caught my eye. 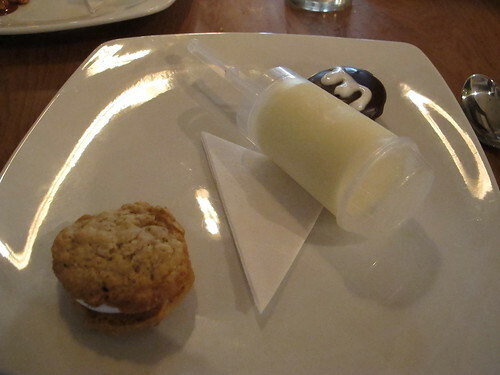 It’s not often that you find a homemade pushpop, ding dong, and oatmeal cream puff on a dessert menu. 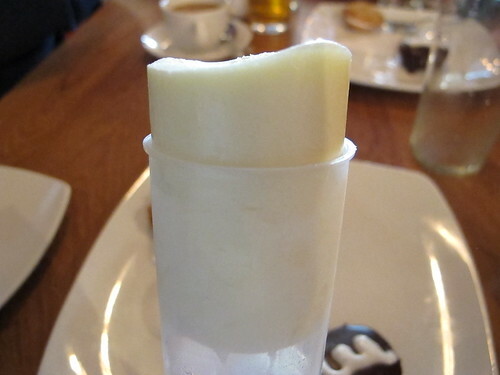 The pushpop was tart and creamy. I don’t remember pushpops tasting like that but I still enjoyed it. Just looking at the ding dong, you know it’s going to be rich. 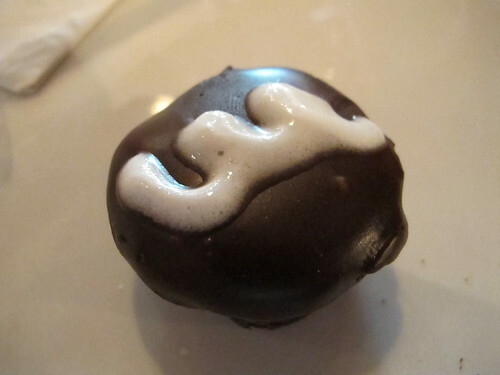 It’s a dark, decadent chocolate surrounding a creamy interior; this was the ding dong perfected. 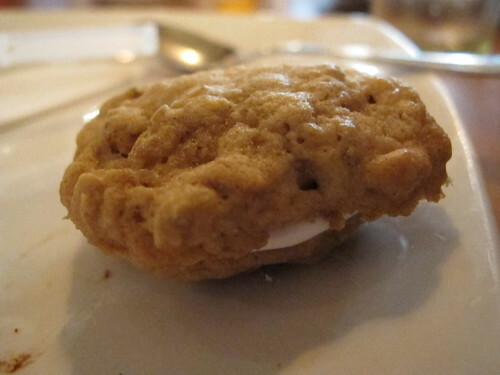 Much on par with the rest of the plate, the oatmeal cream puff was simply delicious. 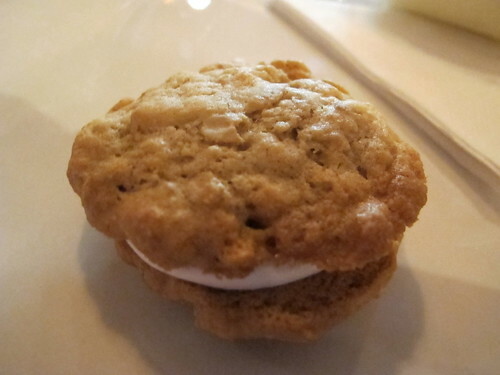 The oatmeal cookie was soft and the cream filling just spectacular. Normally it would take a little longer for me to go back for another lunch, but with family in town, I soon found myself back at Parlor Market. This time, I was able to try their Candied Bacon Old Fashioned. This isn’t the first time I’ve had a bacon flavored cocktail, and it’s always interesting to see just how much bacon shines through. 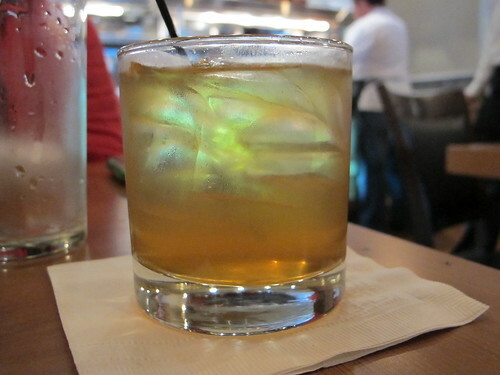 With the Parlor Market version, this was an initial smoky flavor that led to a sugary middle and finished as a watery cocktail. 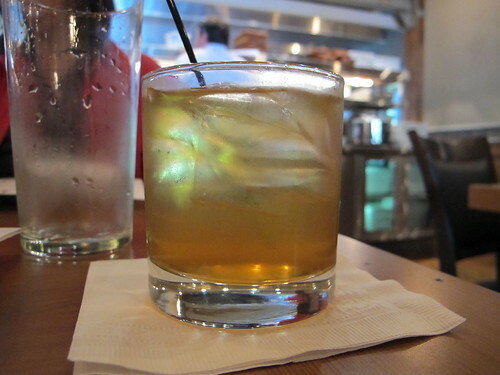 There were none of the usual fruit components of an old fashioned, no taste of bitters, just a watery cocktail that had the distinct smell of uncooked bacon. Once again I was faced with the choice of an entrée. 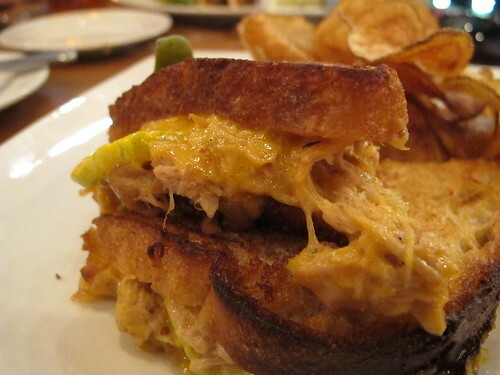 I knew how tender and delicious the Shorty Taco was, but I was drawn to the Mississippi Rabbit Melt. I’m chalking that choice up to rabbit being scarce on Jackson menus. Braised local rabbit, white cheddar, caramelized onions, bacon, and a creole aioli with a side of malt vinegar chips, the whole plate was a beautiful shade of brown. 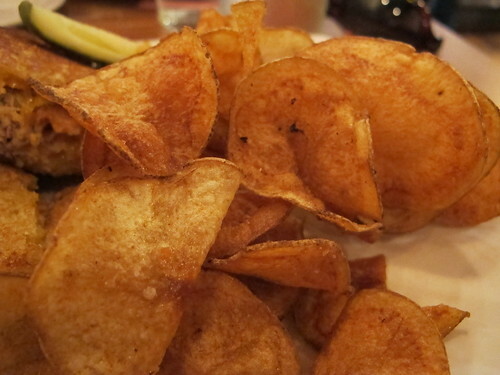 I was surprised at just how thick the chips were, but still quite crispy. Unfortunately, there wasn’t much in the way of forward salt or vinegar, it was more of a subtle flavor. The sandwich was real eye opener. True to form, the rabbit was quite tender with a very unique flavor. The cheese seemed to dominate the sandwich but it was all incredibly juicy and tasty. 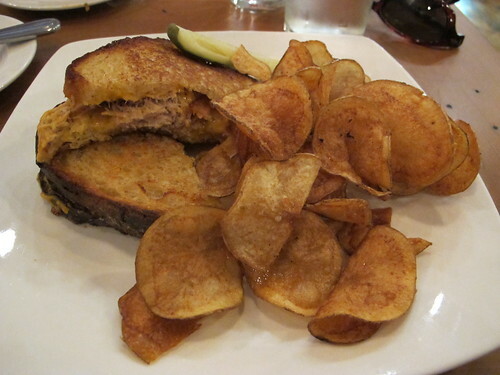 I was amazed at how the bread could be soggy from the juices of the sandwich but at the same time be quite crispy. All together it was a ridiculously meaty, rich, and filling sandwich and well worth a try. Since my visiting family provided little to no indication they were full, we all moved on to the dessert menu. Swayed by the recommendation of our waiter, I went for the Mason Jar Cake. 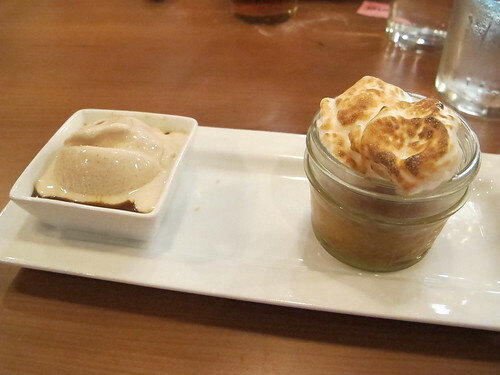 The description read like a taste of fall; pumpkin cake, burnt marshmallow icing, cranberry sorbet, and a caramel sauce all looked spectacular. Once I got past the rich marshmallow icing, I found a slightly dry but still delicious pumpkin cake. The cranberry sorbet may have been overshadowed by the caramel sauce, but it was still incredibly satisfying. 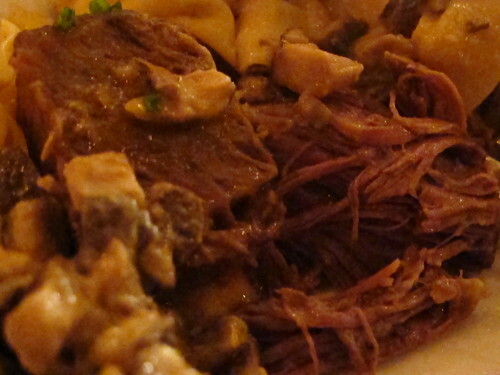 As much as I had enjoyed the lunches at Parlor Market, people kept telling me that dinner was a different animal. After taking a look at a supper menu, I had to agree. With different entrees, more raw bar options and a complete sections of small plates, most notably a charcuterie plate, I knew that I had to have dinner at Parlor. Conveniently the Thanksgiving holiday presented just that opportunity. So the night before Thanksgiving, I once again found myself at Parlor Market, hungry and brimming with anticipation. 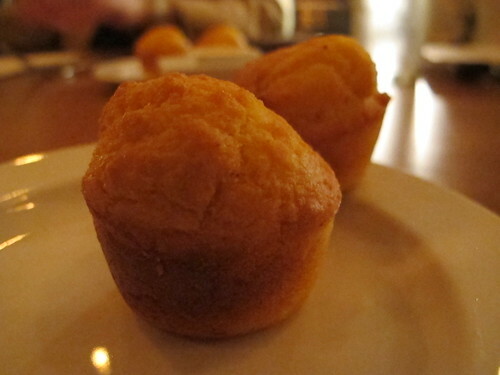 Things started out in a simple vein with cornbread muffins. 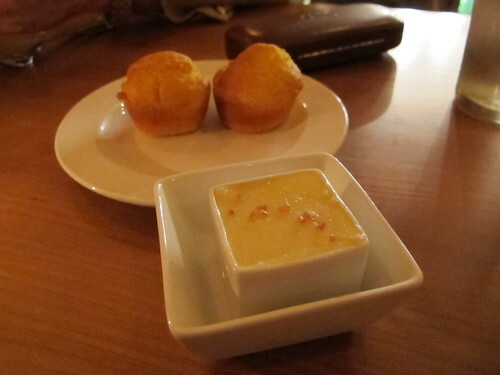 Actually make that cornbread muffins with sorghum butter topped with sea salt. This was good, Southern corn bread, not too moist, salty, and with a good, slightly spicy tail. Combined with the sorghum butter, it was just dying for a bowl of greens. How about a nice cocktail to go with the cornbread? 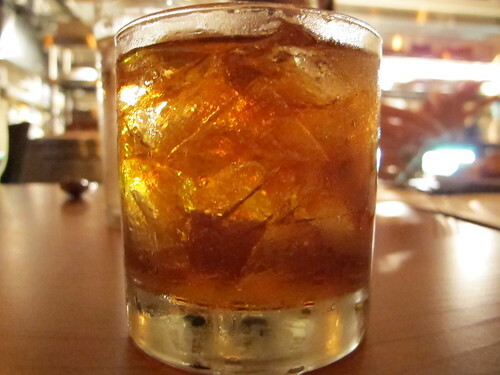 The Vieux Carre was just what I was looking for in a cocktail, pleasantly strong and with a forward taste of bitters. 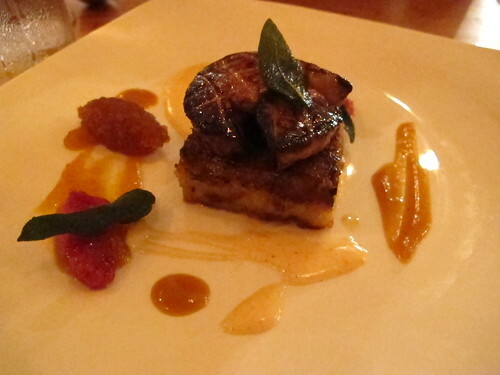 Taking advantage of the relatively rare Jackson offering, an order of the Seared Foie Gras was soon brought to our table. 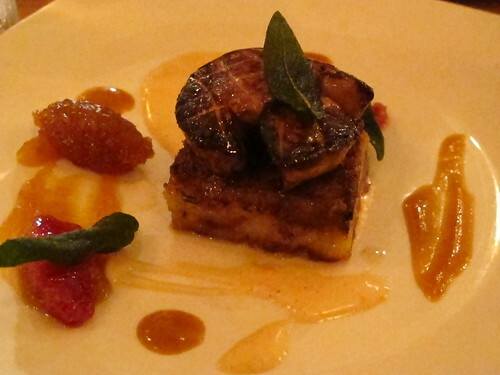 Served with sage brown butter brioche cake, pumpkin marmalade, and blood orange, the foie gras looked perfectly seared. 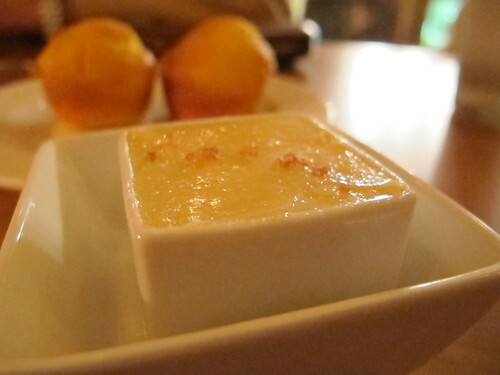 Losing all sight of the marmalade and blood orange, I was wholly focused on the foie gras and cake. 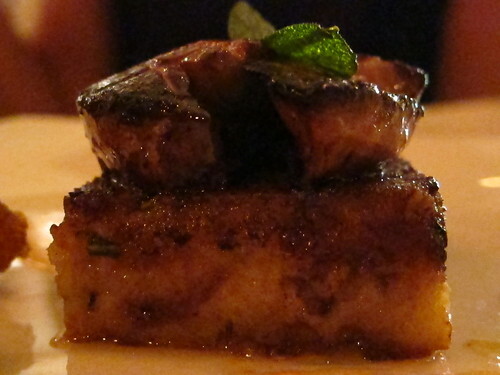 The foie gras really was perfectly seared and was well complimented by the rich, dense cake. The two components were simply staggering and once I incorporated the marmalade and the blood oranges, it was excellent. 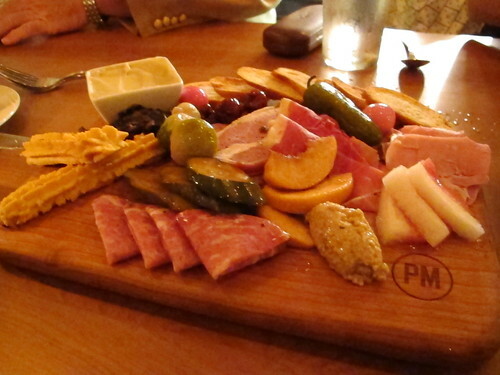 When I ordered the Charcuterie Plate at Parlor Market, I was expecting a few slices of some salamis, maybe a few cornichons, nothing really exceptional. I wasn’t expecting the behemoth that was brought to our table. It’s honestly hard to know where to begin, but between the owner/chef Craig Noone and our waitress, I was given a list of what was in front of us. There was a rabbit rillette, a wild game terrine with boar venison, elk, and antelope, buffalo jerky, cotto salami, cheese straws, pickled cherries, Broadbent prosciutto, pickled brussell sprouts, sweet tea pickles, pickled quail eggs, muscadine ver jus, pickled shitakes, and grain mustard. I’m sure I’ve left something out but it was a staggering amount of food. I thought the rabbit rillette was as good a place to start as any. Despite the solid layer of fat on top, this wasn’t at all greasy. Instead there was a clear, delicious rabbit taste. It really seemed like it was just pepper, salt, and rabbit; all you really need. 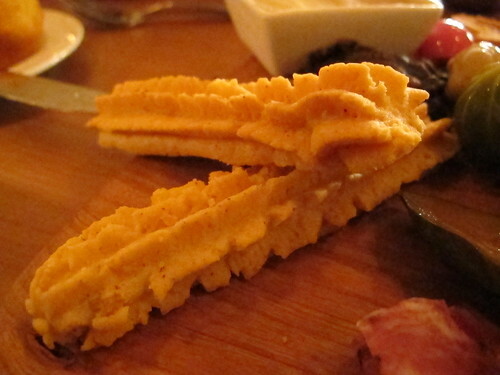 Much like their pimento cheese, Parlor Market’s cheese straws are making me change my opinion on the dish. These are high quality cheese straws with an excellent, strong pepper taste. I’ve had buffalo jerky before, but it was some greasy affair that I’d rather forget. 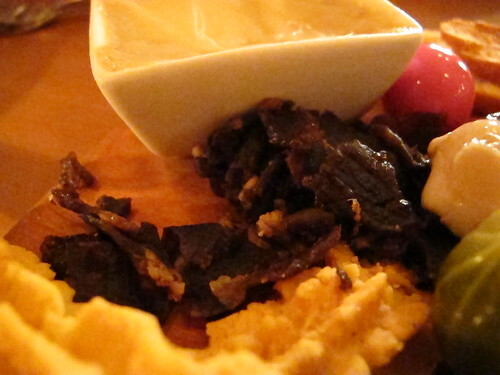 Despite the poor picture, the buffalo jerky was quite nice with a relatively mild flavor. When reading through some of the hype about Parlor, I saw that they would be serving meats from Stan’s Market outside of Oxford. 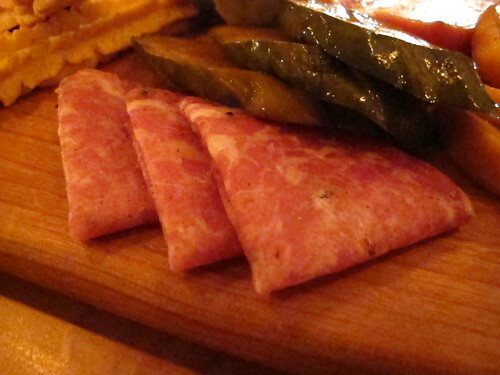 Well, here it is and this simple salami was a welcome addition to the board. 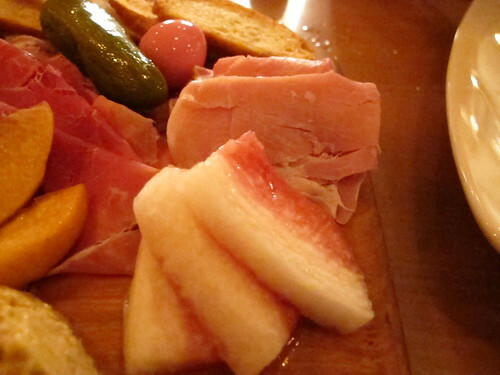 On the far side of the board was the Broadbent Ham and the pickled watermelon. These slices of ham were just as you’d expect, simple, delicious, and with a real depth of flavor. The watermelon was just as rich, but I was expecting something a little more tart. Regardless, it was still quite tasty. 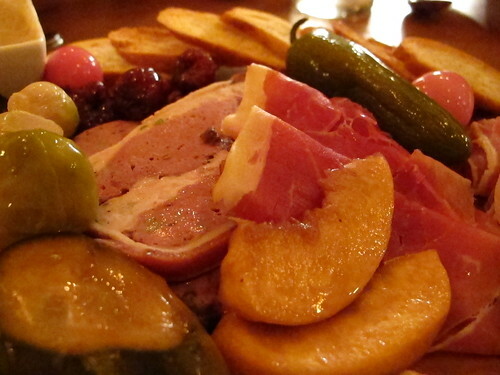 Somewhere in this mounds of meat, fruit, eggs, and vegetables, are two types of terrine. Both the hunter’s terrine and the second were a substantial mix of meat and spice, but they were both chalky and greasy. 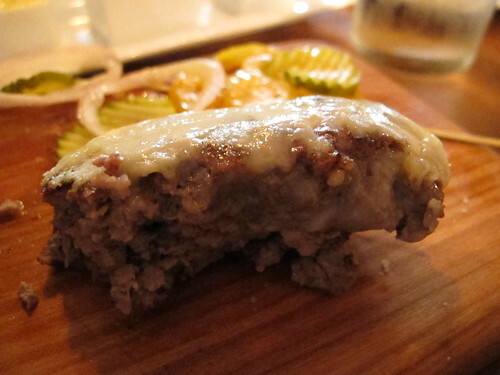 The hunter’s terrine was just a mix of meats with nothing standing out. The second had a more pleasant flavor but the chalky texture of both was too off-putting. 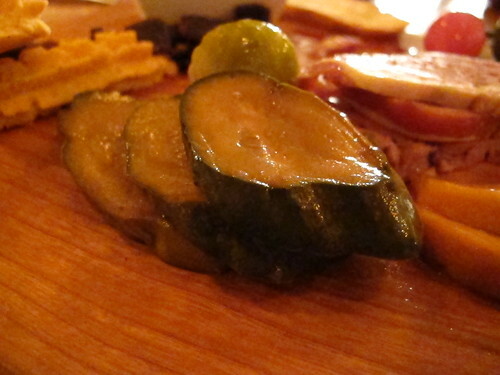 One thing that really surprised me on the charcuterie plate was the sweet tea pickles. At first it’s a strange taste, saltier than I expected but the tea flavor is there. It’s a unique idea and one that's quickly growing on me. I’m sure I’ve left things out from the Charcuterie Plate but it was really too much to handle, especially as a second appetizer for the table. A plate that size could easily be stretched into an entrée if not multiple meals, that’s probably why I took the rest home to enjoy later. Regardless, it was time for our entrees. Call me a sucker for short ribs as it was the Beef Short Rib Stroganoff for me. 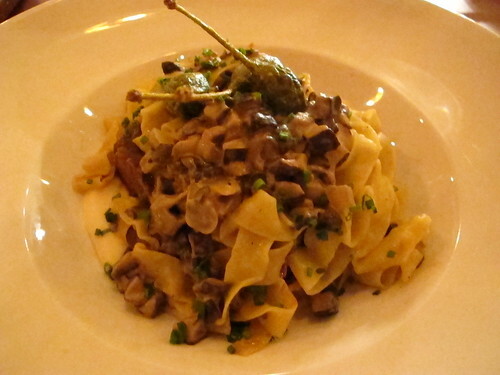 Served with a local mushroom ragout, a house-made tagliatelle, roasted garlic soubise, and fried caperberries, it was certainly a far cry from the stroganoff I grew up with. Once I got over the fact there wouldn’t be any chili flakes or cayenne, I was impressed by the tender tagliatelle, the creamy soubise, and the amazingly tender short ribs. Thankfully Parlor avoided the common pitfall short ribs as these were tender but not at all dried out. 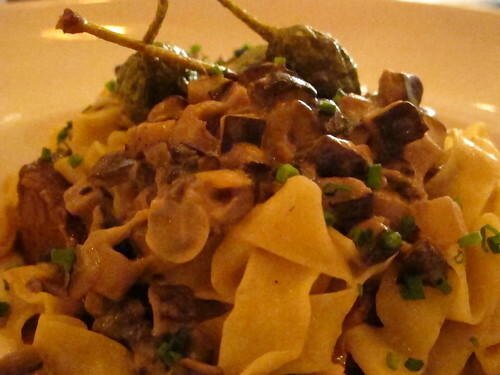 While I still think the stroganoff could have used some spice, I was quite satisfied with the dish, but be forewarned, those fried caperberries are pungent. 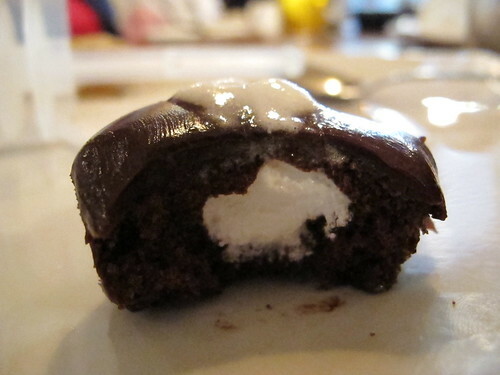 Seeing no reason to break the trend of the previous meals, a serving of dessert was in order. 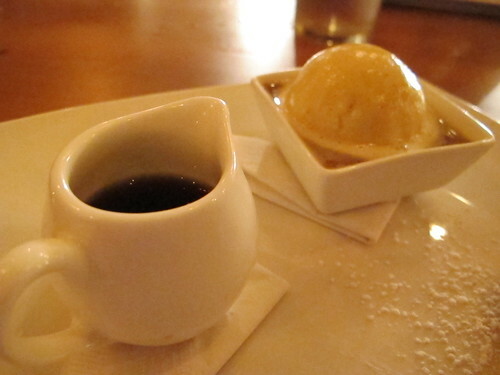 This time I went for the inconspicuous Affogato. 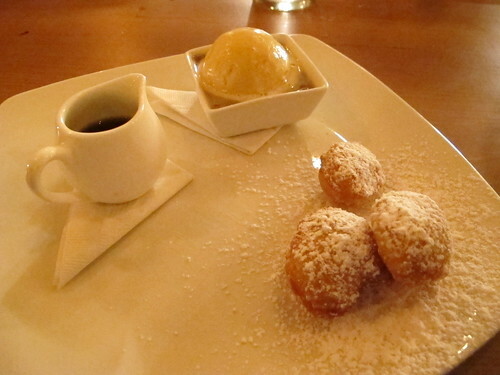 Yes, it’s pretty much doughnuts and coffee, but more so; it’s espresso with Baileys ice cream. 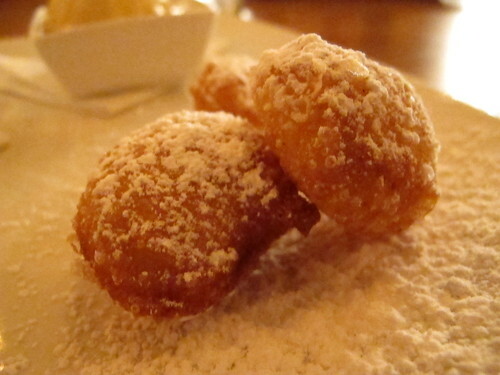 These are not your average donuts, more like a perfectly fried beignet. 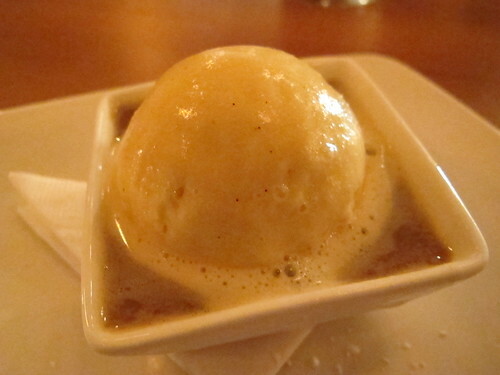 The idea behind an affogato is to pour hot espresso over ice cream and this combination works extremely well with Baileys ice cream. 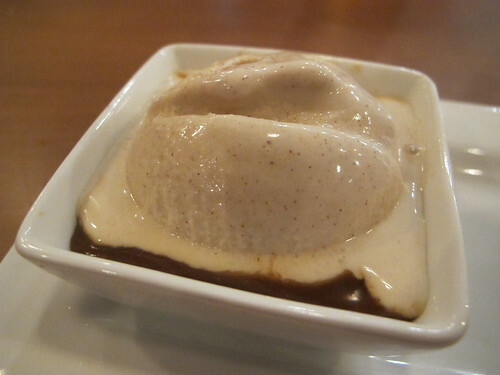 On its own, this espresso is weak-kneed crap, but with the ice cream and doughnuts, it’s amazing. This is one of the few times where I can say a restaurant has deserved the hype. While it may not be breaking much new ground on a national or even regional scale, Parlor Market is in a league of its own in Jackson. As with most any restaurant, not everything was perfect, but overall it was quite astounding. Craig Noone has brought a new style of restaurant to Jackson, one that is well worth multiple visits. With all the press around Parlor Market I too was wondering if it would live up to the hype. 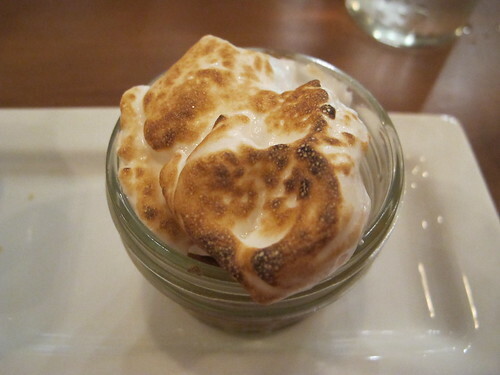 This is a great review and I'm looking forward to eating there, especially the desserts! -Glad to see I'm not the only one who was suspicious of all the hoopla. I wondered about the hype, too. Funny thing: I was there the same night as your dinner review, and ate at the bar (dropped in without a reservation). The food was superlative. The service at the bar was scattershot, although the cocktails were wonderful (great version of a papa doble, for instance). I may post some about it with a link to this review. Nice long discussion of the place. Did the pricing on the oysters seem through the roof to you? I was unsure I was getting correct info, and may be spoiled by the prices at Snack Bar in Oxford or anywhere in New Orleans, but $24-30 for gulf oysters seemed high to me. Although the range and quality of offerred sauces may be part of the deal. Beef Stroganoff.... Thanks Ad Hoc at Home...hahaha....minus the fried caperberries oops that does not work guys.